Oman : When and where to go? 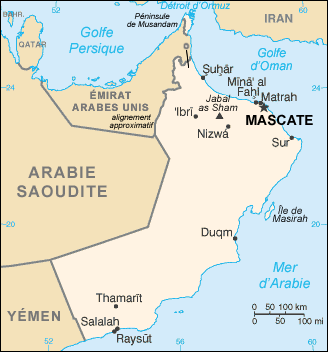 Two main types of climate prevail in Oman; Mediterranean in the East and North, and tropical in the West and South. However, a more desert climate is prevalent in the centre with permanent heat, even at night. Elsewhere, humidity is high and the South and West experience monsoon weather between June and September. The best time to visit Oman is between October and March, temperatures are warm and you avoid the monsoon in the South. Nature that is protected, a strong cultural identity and a tradition of exchange are just a few of the characteristics of this country that only recently opened up to tourism for the pleasure of its visitors. The capital, Mascate, has an authenticity that immediately attracts the visitor; wander around the old port quarter, admire the three forts, visit the Oman Museum and the national Museum of Ruwi, stroll around the fish market at Mutra and in the Souk and simply absorb the charm from the different areas of this unique town. Salala is very different mainly due to its meridian situation and tropical climate. From there, discover the southern villages and the archaeological sites, especially the ruins at Al-Balid and make a stopover at the beaches on the coast. In the north of the country, the coast is definitely worth a visit; the fort at Barka, the port of Sahar – all white and dominated by its unique tower and Nakal with its water source at the heart of a refreshing oasis are just some of the places to visit here. Finally, if you have the opportunity, explore the red desert of Wahiba with a 4 wheel drive, its magnificent landscapes and the Bedouin who live there will leave a lasting impression. Seeb Airport, around 40 kilometres from Mascate, receives flights from many European airports. You will need a visa to enter the country, this you can obtain fairly easily through your travel agent. The currency in circulation is the Omani Rial. The budget required is fairly moderate concerning food although more expensive for lodging. Plan around €70 for a reasonable double room and less than €15 for a reasonable meal. There are no particular health problems to consider. If you go into the desert looking for adventure then do not go alone and watch out for snakes and scorpions. For travelling inside the country there are flights between Mascate and Salala as well as the bus that travels between the major towns. The most economical form of transport is the collective taxi or minibus that is available on call.